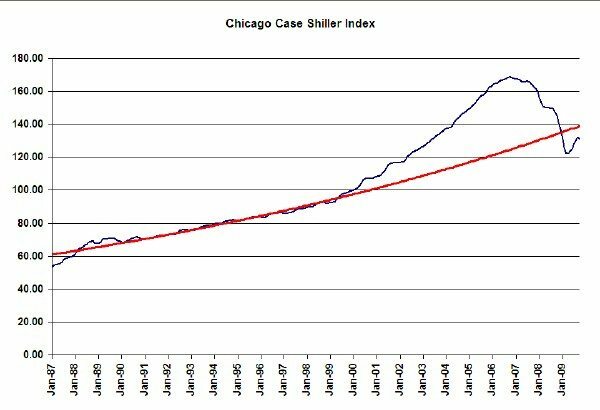 The Case Shiller home price index came out this morning and it shows renewed price declines for the Chicago area. The home price index fell 1% in October. We are back to May 2003 levels, which represent a 10.1% year over year decline in Chicago area home prices. This also equates to a 22.4% decline in prices since the bubble peak in September 2006. What that means, BTW, is that anyone who put less than 22.4% down in the last 3 years has had their down payment wiped out. Most importantly, take note of where we are relative to the trend line above. The fact that we remain below trend definitely suggests that prices should move up from here.